This year I have begun working as a peer mentor and aiding in teaching a freshman survey class for students in the biological sciences majors in the honors college. Although I am typically shy and uncomfortable speaking in front of large crowds, this is something I really felt compelled to do since one of my peer mentors in my survey class as a freshman made a lasting impression on me and served as a mentor, helping me navigate through my freshman year and my decision to become pre-med. I hope that I can make an impression on at least one of the students in the room and be a resource for those struggling with similar issues that I was in my freshman year. Already I can feel myself becoming more accustomed to speaking to the class, and I am eager to impart what wisdom I have on campus resources and general education courses. I have to set up two social events this semester for the students to attend, and at my first one (where I watched a student-produced play on campus with freshmen students), I felt like I made a genuine connection with the students and had a great time myself. This experience has been very rewarding for me because I love to help others in any way I can, and I am excited to help with next year’s survey classes as well! This week, I got accepted into the Biological Sciences Honorary, Helix Tri-Beta! I am looking forward to this opportunity to meet students with similar interests as me and to get involved in some of the volunteer experiences they offer! Each year Helix Tri-Beta helps with Bioscience Day, where high school students come to Ohio State and learn what it’s like to be a science major. This is an activity I am especially eager to participate in, as I know my high school self would have benefited from it greatly. In addition, there are many internship and shadowing opportunities that I would love to take advantage of in order to experience numerous medical settings and decide which I like the best. The networking opportunities and career-applicable experience I will gain from this club is invaluable, and I am ecstatic to begin participating in this and working with new faces! This year I have begun working on a panel of athletes known as the Peer Educators. We meet monthly to discuss programs on physical and mental health we can put on around the university for both athletes and non-athletes. One program I am really excited about starting is a week of activities at the Younkin Success Center during finals week. We plan to have one fun event happening each day, such as therapy dogs arriving, stress relief yoga, or massages. I really enjoy being in this organization because I like to help people, and wellness is an area I am especially interested in as both an athlete and a pre-med student. I hope that by continuing to work in this club I will make connections with more students on campus and be able to help educate them on wellness and provide resources to aid in their well-being. Since March 2018, I have been working as a lab volunteer in the Skeletal Biology Research Lab within the Injury Biomechanics Research Center at Ohio State. I assist in research projects by scanning/imaging slides, cleaning and labeling bones, and performing DXA scans on subjects. This experience has proven to me that I do belong on the medical track I am currently pursuing, as I find the anatomy of the human body and the work I am currently doing to be fascinating. I find this work very rewarding because I have met like-minded people who have similar interests to myself, and I know that what I am doing now is setting a foundation for future scientific endeavors for not only myself, but also for others who decide to study the bones and slides I have been preparing. By learning how to identify segments of bones and work with slides, I am learning skills I can use in my ultimate career goal of being a forensic medical examiner. In order to achieve global awareness, I aim to meet and make friends with people from other places, join clubs that help with global issues, and perhaps even study abroad. In addition, I will be sure to take global studies and diversity courses in order to broaden my perspective on the world and the people around me. For original inquiry, I plan to participate in a summer internship with a researcher, get involved in some sort of educational club, and, most importantly, ask questions in class while simultaneously studying beyond the scope of the class. It is important to remain forever curious, constantly inquiring and searching for information. Having a plan for academic enrichment is incredibly important in pursuing a professional interest. For this category I plan to always study and complete all assignments, take challenging courses, and get involved with clubs and study programs. The world needs leaders, and in order to be a leader to those around me, I will not only lead by example, but I will also listen to everyone’s perspectives in an attempt to be diplomatic and eventually run for a leadership position in a club. Finally, to remain engaged in service, I plan to continue helping out at the Ronald McDonald house with the swim team, engage in volunteer opportunities, and help tutor others who need help. 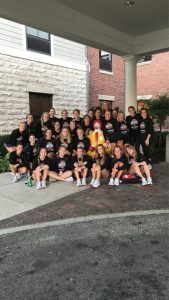 The swim team went to the Columbus Ronald McDonald house and cooked a meal for the families there. This was a very rewarding as well as fun experience because we got to help those in need while simultaneously bonding as a team. Cooking here was my first collegiate volunteer experience, and I want to continue to do community service similar to this.